Apparently I’ve spent my entire life driving straight past one of the best hikes and views around. No, really. Right off of 302 in Twin Mountain/Bethlehem is a seriously fantastic hike and I’m bummed we didn’t check it out sooner. To make myself feel better about not checking it out sooner, I’m going to make sure you know about it. Ready? If you’ve ever gone to Bretton Woods or taken Route 302 from the 93 North side, you’ve driven right past the Sugarloaves. So next time, stop and go hike! The trailhead can be found off of Route 302 on Zealand Road. Don’t park in the first parking lot you see from 302. Go another .9 miles until you see a bridge. We parked right before the bridge. And just a note: This trailhead is within the White Mountain National Forest so you do need a parking pass. You can grab one at the trailhead if you have cash, but we highly recommend dropping in the ranger station at the Lincoln Visitor Center (Exit 32 off North 93) and grabbing an annual pass if you have a chance. 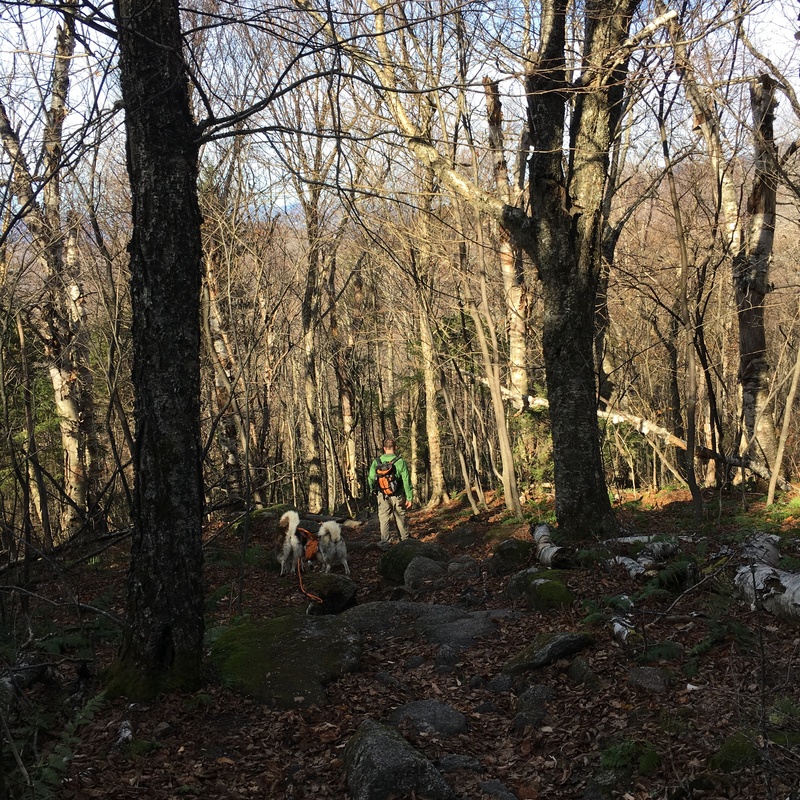 We’re kind of like our dogs in that we love trails with variety, and the trail up the Sugarloaves definitely gave us plenty of that. 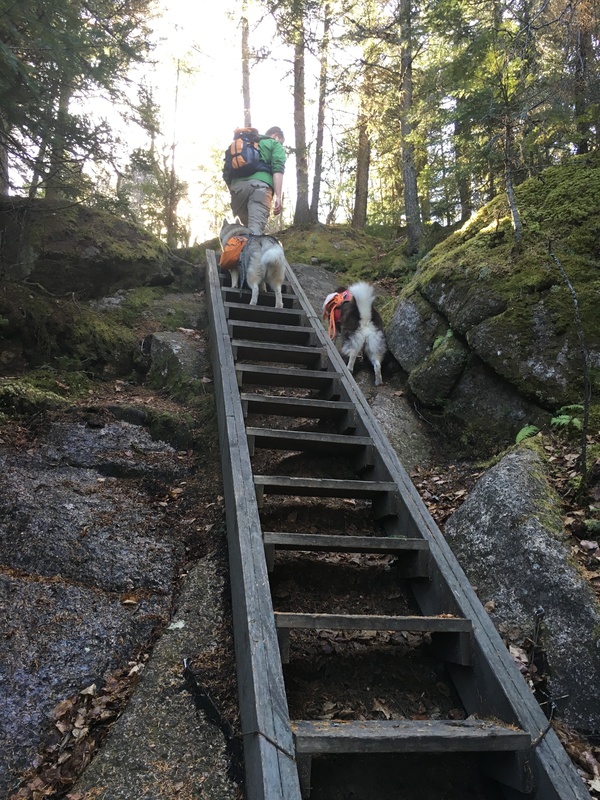 We meandered along the river, climbed up worn rock stairs, ambled through birch forests, and even got to spend some time in a very fragrant evergreen patch (my favorite!). If I was in charge of ranking hikes, I’d put this one right in the middle of moderate. Not altogether easy and definitely not impossible. Now, this hike is interesting in that it actually has two summits to visit to really cover it all. 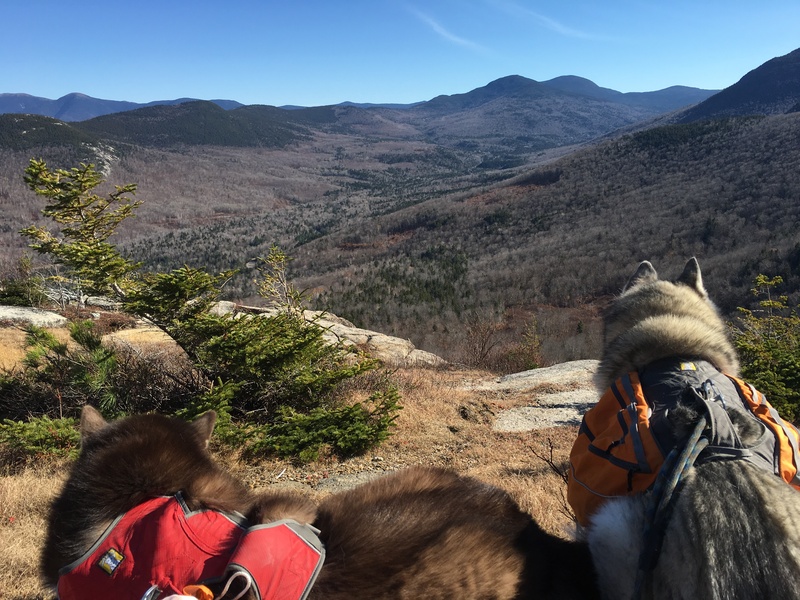 We had heard rumors that Middle Sugarloaf was really where the views are at, so we checked that one out first – and then realized we had no reason to head to North Sugarloaf and skipped it. Middle Sugarloaf was just too pretty! Needless to say, if you want to do both peaks save the best for last and do North Sugarloaf first. 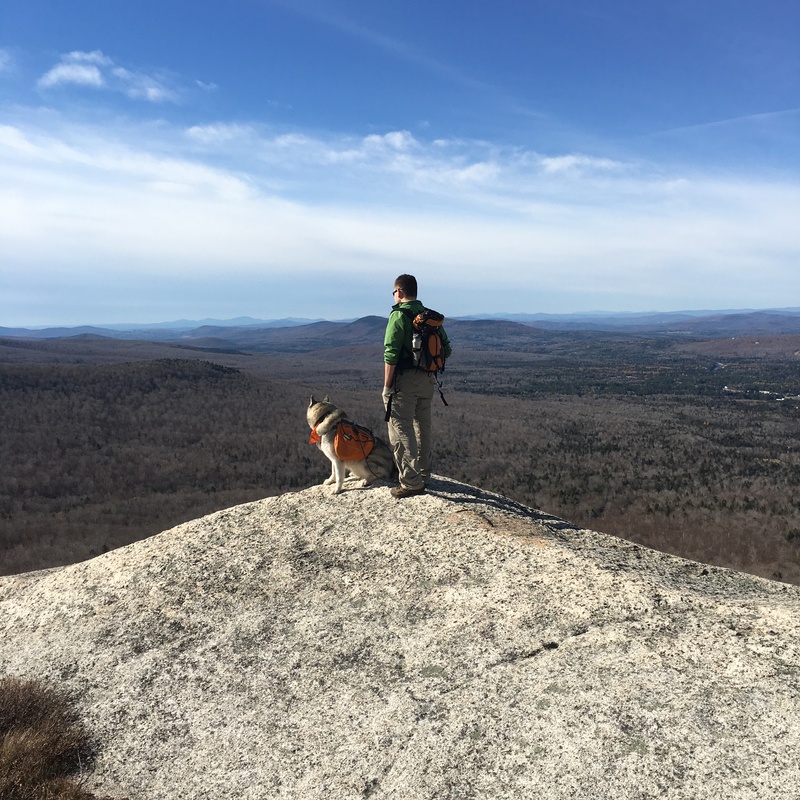 While the trail was totally kid and dog friendly, we’d like to urge some caution on the summit because there are some seriously lovely cliffs and drops. Yuri is a natural magnet to this stuff and Kina gets distracted easily, so both fur kids were on leash for this part. Oh puppies. Fortunately, the views are worth every step and you’ll be greeted with entirely unobstructed views of the Presidential Range. In fact, I have never seen a view quite this good! Wondering why these two peaks are called the Sugarloaves? I was too. Apparently back before granulated sugar was a thing, sugar was distributed in a “loaf” form that people would chip away at. The loaf was shaped kind of like a cone, so naturally a mountain with a cone shape was a good contender for being called a sugarloaf. And now you know. Oh, and a final note – Zealand Road is closed during the winter meaning you’ll have to park at that initial parking lot close to 302 and hike in. It’s a mostly flat road, so it shouldn’t be bad at all on snowshoes. For information on whether it’s closed or open, check out this lovely link. Look at all that moss! Super cool. Thanks for the linguistics lesson — there are some “Sugarloafs” in Georgia too, and I’d always wondered where that goofy word came from. Have you heard of the Liebster Award? It’s this silly thing that gets passed around the blogosphere — you ask someone 11 questions, and they answer them on their blog, write their own, and nominate someone else. At first I thought it might be kinda spammy, but it’s just a fun way for bloggers to promote one another and introduce their readers to new content.